West Hollywood approved a proposal to remove Trump's Hollywood star. The city of West Hollywood approved a proposal to remove President Donald Trump's star from the Hollywood Walk of Fame on Monday, citing recent costly vandalism and recent demonstrations around the star. 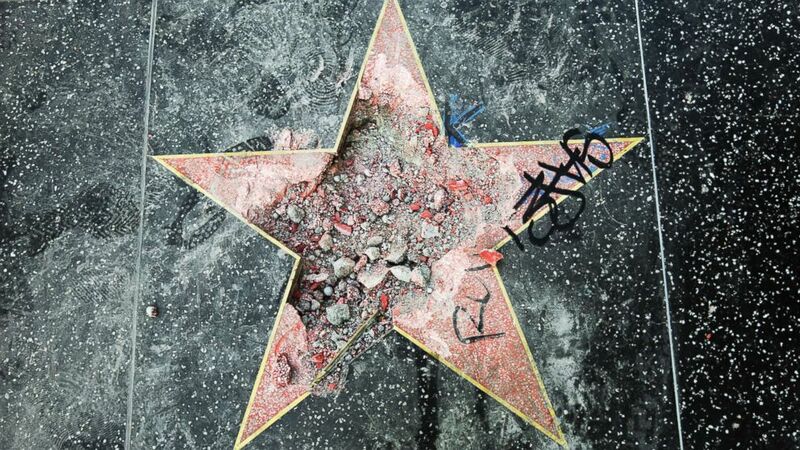 West Hollywood’s five-member city council passed the measure unanimously on Monday evening, allowing it to move forward with a request to remove the star, which has been vandalized several times since Trump took office last year. It now plans to send a formal letter to Los Angeles Mayor Eric Garcetti, the Los Angeles City Council and the Hollywood Chamber of Commerce for consideration. The Chamber of Commerce would have the final say in removing the star. 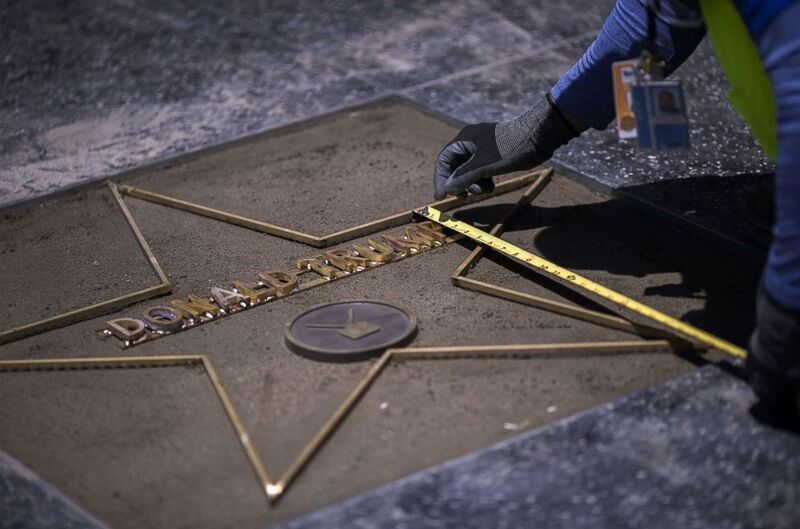 (David McNew/AFP/Getty Images) Workers replace the Star of President Donald Trump on the Hollywood Walk of Fame after it was destroyed by a vandal in the early morning hours on July 25, 2018 in Los Angeles, California. Brought forth by West Hollywood council members John D'Amico and Lindsey Horvath, the proposal cited the president’s treatment of women and his views on climate change as catalysts. "Similar to how certain members of the entertainment community have been removed from the Academy of Motion Pictures, due to their actions toward women, reflecting a stance on their values by the Academy, this is an opportunity for decision-makers to take a stand on their values in support of women and against disturbing treatment of women," the West Hollywood City Council said ahead of Monday’s vote. (Reed Saxon/AP) This photo shows Donald Trump's star on the Hollywood Walk of Fame that was vandalized, July 25, 2018, in Los Angeles. The members also noted Trump’s policies, including a decision to withdraw from the Paris Climate Agreement, a ban on transgender military officers and the separation of families at the U.S. border with Mexico, among reasons for the removal. The president received a star on the Walk of Fame in 2007 for his work as producer of the Miss Universe Pageant. Trump co-owned the Miss Universe Organization, which also included the Miss USA and Miss Teen USA pageants, for nearly 20 years. (Ringo Chiu/Splash News via Zuma Press) Workers repair the Donald Trump's star on the Hollywood Walk of Fame in Los Angeles on July 25, 2018. Trump's star was destroyed Wednesday morning by a man with a pick ax, the second time in less than two years the star was vandalized. There have been campaigns to remove stars in the past, but it hasn’t happened in the Walk’s 40-year history. Hollywood Chamber of Commerce CEO Leron Gubler knocked down a proposal to remove Bill Cosby’s star in 2015, saying, "Once a star has been added to the Walk, it is considered a part of the historic fabric of the Hollywood Walk of Fame." “Because of this, we have never removed a star from the Walk,” he added. The Hollywood Chamber of Commerce released a statement after the most recent vandalism of Trump's star on July 25, saying it hopes people "would project their anger in more positive ways." Austin Mikel Clay, 24, was charged with one count of felony vandalism on Monday for allegedly destroying the star with a pickax in that incident two weeks ago. He could face as many as three years in jail.